The account added that the team also found tablets with inscriptions that suggest the giant belonged to a race of superhumans that are mentioned in the Mahabharata, a Hindu epic poem from about 200 B.C. "They were very tall, big and very powerful, such that they could put their arms around a tree trunk and uproot it," the report said, repeating claims that initially appeared in 2004. Voice editor P. Deivamuthu admitted to National Geographic News that his publication was taken in by the fake reports. The monthly, which is based in Mumbai (Bombay), published a retraction after readers alerted Deivamuthu to the hoax, he said. "We are against spreading lies and canards," Deivamuthu added. "Moreover, our readers are a highly intellectual class and will not brook any nonsense." Other blog entries—such as a May 2007 posting on a site called Srini's Weblog—cite a report supposedly published in the Times of India on April 22, 2004. But a search of that newspaper's archive revealed no such article. Variations of the giant photo hoax include alleged discovery of a 60- to 80-foot long (18- to 24-meter) human skeleton in Saudi Arabia. In one popular take, which likewise first surfaced in 2004, an oil-exploration team is said to have made the find. Here the skeleton is held up as evidence of giants mentioned in Islamic, rather than Hindu, scriptures. Web sites dedicated to debunking urban legends and "netlore" picked up on the various giant hoaxes soon after they first appeared. California-based Snopes.com, for example, noted that the skeleton image had been lifted from Worth1000, which hosts photo-manipulation competitions. 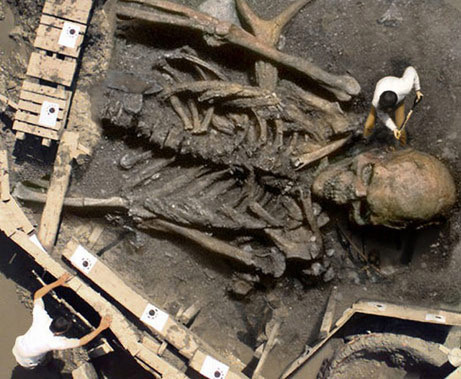 Titled "Giants," the skeleton-and-shoveler picture had won third place in a 2002 contest called "Archaeological Anomalies 2." The image's creator—an illustrator from Canada who goes by the screen name IronKite—told National Geographic News via email that he had had nothing to do with the subsequent hoax. He added that he wants to remain anonymous because some forums that debated whether the giant was genuine or not "were turning their entire argument into a religious one." It was argued, for instance, that the Saudi Arabian find was entirely consistent with the teachings of the Koran. "This was about the same time that death threats and cash bounties were being issued against cartoonists and other industry professionals for doing things like depicting the Prophet Mohammed," IronKite wrote. IronKite started with an aerial photo of a mastodon excavation in Hyde Park, New York, in 2000. He then digitally superimposed a human skeleton over the beast's remains. "If you look, he's holding a yellow-handled shovel, but there's nothing on the end," IronKite said. "Originally, the spade end was there. But [it] looked like it was occupying the exact same space as the skeleton's temple, making the whole thing look fake. "Now it looks like he's just holding a stick, and people don't notice. It's funny." IronKite also altered the color of the man's clothing to create a "uniform tie-in" with the white-shirted observer peering down from the wooden platform. IronKite said he's tickled that the picture—which took only about an hour and a half to create—has generated so much Internet attention. "I laugh myself silly when some guy claims to know someone who was there, or even goes so far as to claim that he or she was there when they found the skeleton and took the picture," IronKite said. "Sometimes people seem so desperate to believe in something that they lie to themselves, or exaggerate in order to make their own argument stronger." David Mikkelson of Snopes.com said such hoaxes succeed when they seem to confirm something people are already inclined to believe, such as a prejudice, political viewpoint, or religious belief. A hoax also needs to be presented "in a framework that has the appearance of credibility," he said in an email. The "ancient giant" has both elements, according to Mikkelson. "It appeals to both a religious and a secular vision of the world as different and more fantastic than mere science would lead us to believe," he said. "Proof," Mikkelson added, "comes in the form of a fairly convincing image." For anyone who may have knowingly propagated the myth, Mikkelson added, the motivation "probably wasn't any different than the motivation for engaging in a game of ringing someone's doorbell and running away—because it's an easy way to have a laugh at someone else's expense." Alex Boese, "curator" of the virtual Museum of Hoaxes, said fake giants have a long history going back to the at least the 1700s. The recent hoax is reminiscent of the once famous Cardiff Giant myth, involving a ten-foot-tall (three-meter) stone figure dug up in 1869 in Cardiff, New York, Boese said. Many people believed the figure was a petrified man and claimed he was one of the giants mentioned in the Bible's Book of Genesis: "There were giants in the Earth in those days." Likewise, Boese said, the recent giant hoax "taps into people's desire for mystery and their desire to see concrete confirmation of religious legends."